Looking for fun things to do in the Philippines? 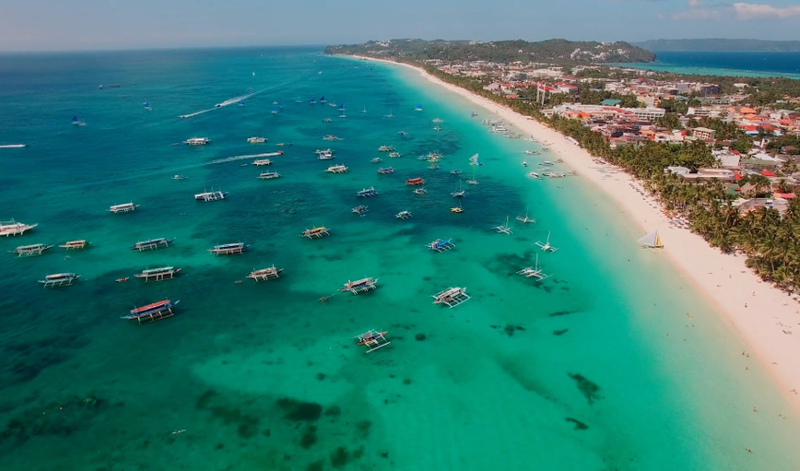 Look no further than our list of 15 fun things to do in the Philippines! 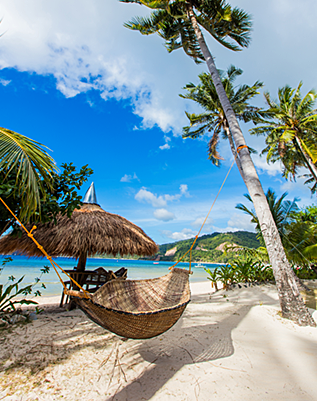 You may have heard that it’s more fun in the Philippines, so find out some reasons why. 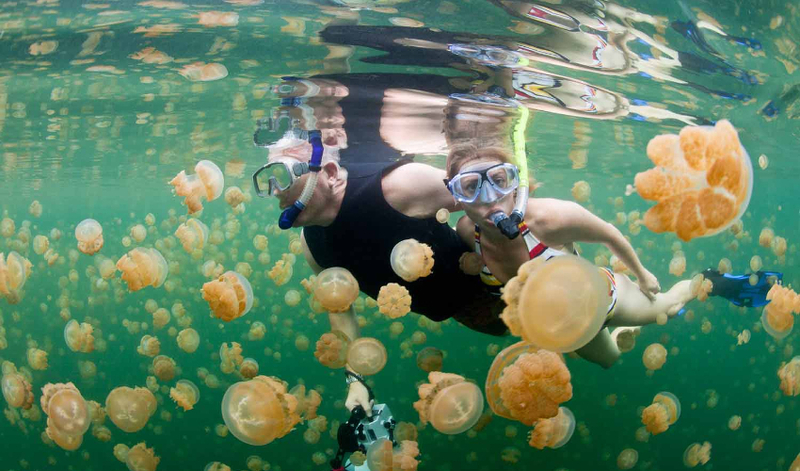 Our first fun place in the Philippines is the Tojoman Lagoon or the Jellyfish Lagoon in Surigao del Norte province is the only place in the Philippines where you can swim with a million stingless jellyfish. However, you need to rent a paddle boat because motorboats are not allowed on the lagoon. Have you ever driven together with more than four people on one motorcycle? 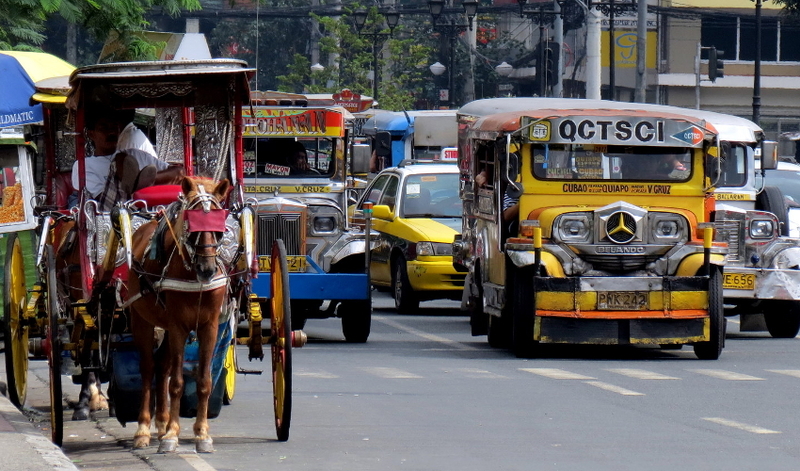 In the Philippines, there are actually motorcycle-taxis that can take up to five passengers (with their luggage). These taxis are very common outside the cities where taxi cars don’t go. If you love adventure, this is the one fun thing you should try in the Philippines. 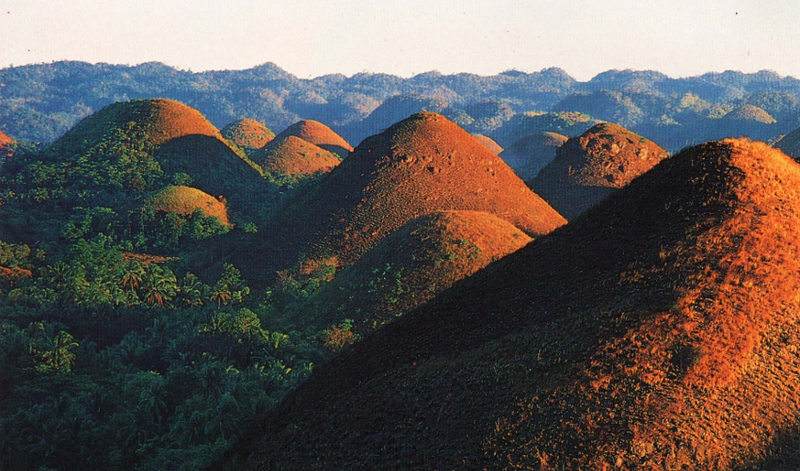 In Bohol, there are more than 1,260 cone-shaped limestone hills covered with green grass that turns chocolate brown in the dry season. Sorry, chocolate lovers, you won’t be able to eat the chocolate mountains – but you sure can enjoy the lovely view! 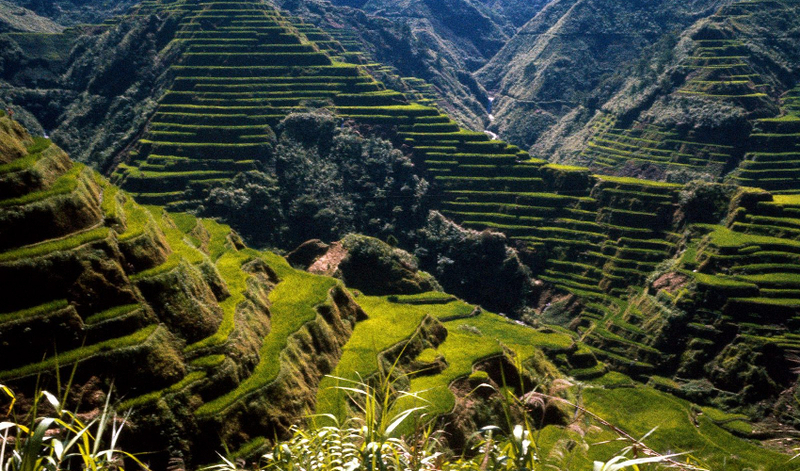 The 2000-year-old Banaue rice terraces are considered the eighth wonder of the world. If you could separate the rice terraces into single pieces and connect them end to end – they would reach halfway across the globe and would be 10 times longer than the Great Wall of China. In many places across the Philippines, rum is actually cheaper than juice and a bottle of beer costs less than a dollar. Don’t get me wrong, I’m not encouraging you to drink alcohol – but if you enjoy a nice cocktail from time to time, the Philippines is truly one of the best places to do it. The Jeepney public bus is one of the most popular ways to get around Manila and other cities in the Philippines. The famous Jeepneys, with their colorful artwork and decorations, are actually made from old US military jeeps left over from World War II. 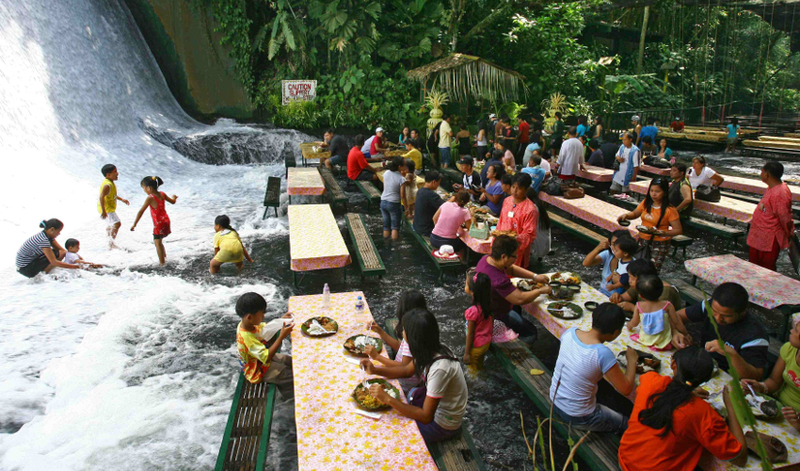 The Villa Escudero Resort in San Pablo City has a restaurant – the Waterfall Restaurant – where you can enjoy delicious local cuisine sitting at handmade bamboo tables while crystal-clear spring water flows over your feet. If you love karaoke, you’ll definitely enjoy the Philippines. In 1975 Roberto del Rosario patented the Karaoke Sing Along System. Since then, the Philippines has been the capital of karaoke – it’s so popular there that supermarkets even promote their grocery items through karaoke! Binondo, an authentic district in Manila, is also the world’s oldest Chinatown. 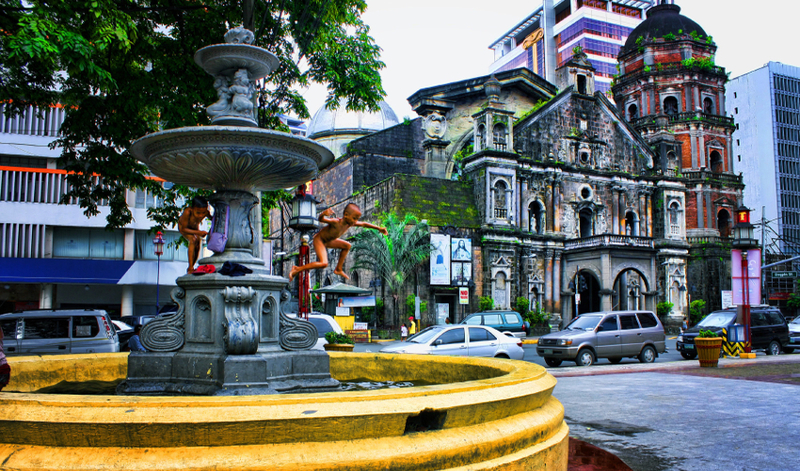 In Binondo, you can find many amazing places to enjoy traditional Chinese cuisine and see historical landmarks. The Philippines is known for having some of the friendliest and most hospitable people in the entire world. The country is also known as the Land of Smiles. If you’re in the Philippines, you have to try the traditional halo-halo! It’s one of the most popular Filipino desserts. 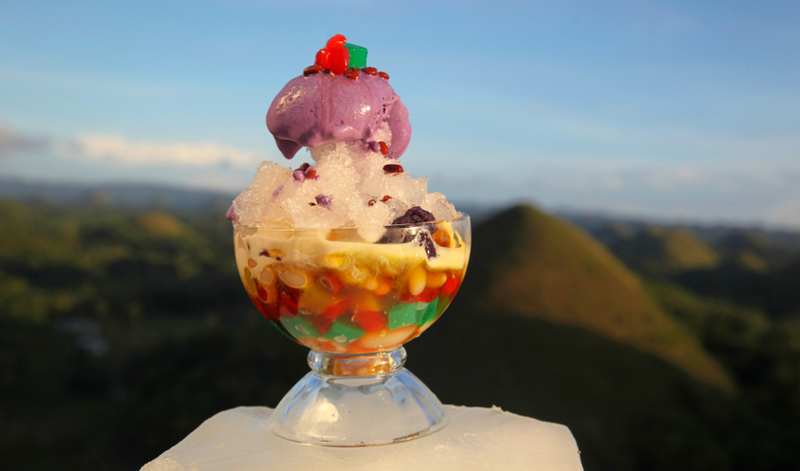 Halo-halo is a mixture of shaved ice, evaporated milk, and delicious boiled sweet beans, jello, and fruits. Have you seen the YouTube video called “Dramatic Tarsier” with a cute little creature opening his eyes wide? Well, this lovely creature comes from the Philippines and is called a Philippine tarsier. Although the Philippine tarsier isn’t really a monkey, it’s considered to be the world’s smallest monkey. To meet this little guy in person, visit the chocolate mountains or the islands of Samar, Leyte, Bohol, or Mindanao. There are more than 200 volcanoes in the Philippines. Don’t worry, only a few of them are active! But if you don’t like the idea of being close to volcanoes, visit Palawan. This province is the furthest away from the volcanoes and earthquake zones. So, I suppose now you want to know how to book flights to Manila? Check out our guide for everything you need to know. How can we get such good flight deals to Manila? Because of our airline contracts and unpublished airfares. Are $100 Flights Fake or Real?